The 2004 United States presidential election in New Jersey took place on November 2, 2004, and was part of the 2004 United States presidential election. Voters chose 15 representatives, or electors to the Electoral College, who voted for president and vice president. New Jersey was won by Democratic nominee John Kerry by a 6.7% margin of victory. Prior to the election, most news organizations considered it as a state Kerry would win, or a blue state. Although due to the impact of the September 11, 2001 attacks and the resignation amidst scandal of Governor James McGreevey, the state was considered an interesting race. Polls showed Senator John F. Kerry with a slim lead throughout the campaign and the Republicans invested some campaign funds in the state. In the end, however, Kerry took New Jersey by a comfortable margin. To date this is the last time the Democratic margin of victory was less than 10%. As of the 2016 presidential election[update], this is the last election in which the Republican candidate won Somerset County. Kerry won most of the pre-election polls taken in this state, but mostly by small margins. The final 3 polling average showed the Democratic leading 49% to 42%. 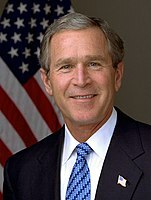 Bush raised $5,934,011. Kerry raised $6,513,274. Generally, Kerry was very dominant in the urban centers of the state, particularly in Essex, Hudson, and Camden Counties. However, Bush made inroads in Bergen County, where many wealthy residents reside, and in other South Jersey counties. Bush controlled largely rural parts of the state, such as the Northwest (Hunterdon, Somerset, and Morris are also among the ten wealthiest counties in America) and Salem County. Monmouth County's wealthy population and Ocean and Cape May Counties' older population also contributed to Bush's relative success in this largely Democratic state. Kerry won 7 of 13 congressional districts. 43% 57% Frank Pallone, Jr.
46% 54% Rush D. Holt, Jr. The following were the members of the Electoral College from the state. All 15 were pledged for Kerry/Edwards. ^ "Election poll data". uselectionatlas.org. 2004. ^ "John F Kerry - $345,826,176 raised, '04 election cycle, Democrat Party, President". www.campaignmoney.com. ^ "Dave Leip's Atlas of U.S. Presidential Elections - New Jersey 2004". ^ "Official General Election Candidates List" (PDF). ^ "Presidential Results by Congressional District, 2000-2008 – Swing State Project". ^ "U. S. Electoral College 2004 Certificate". www.archives.gov.